Kelly McDonald is a marketing and advertising specialist and considered one of the nation’s top experts in consumer trends, generational differences and leveraging the customer experience. She is the founder of McDonald Marketing, which has twice been named one of the “Top Ad Agencies in the U.S.” by Advertising Age magazine and ranked as one of the fastest-growing independently-owned companies in the U.S. by Inc. Magazine. She has been featured on CNBC, in Forbes Magazine, BusinessWeek, Fast Company, on CNNMoney.com and on SiriusXM Radio. 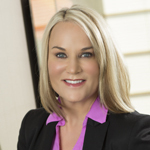 Her client experience includes iconic brands such as Toyota, State Farm, Nike, Harley-Davidson, Miller-Coors and Sherwin-Williams. In addition to her extensive public speaking experience, she is also the author of three bestselling books: Her latest, “How to Work With & Lead People Not Like You”, was #9 on the list of Bestselling Business Books of 2017. Her first, “How to Market to People Not Like You”, was #7 on the list of Bestselling Business Books of 2011. Her second book, “Crafting the Customer Experience for People Not Like You”, was #5 on the list of Bestselling Business Books of 2013. Kelly is originally from Milwaukee, Wisconsin and graduated from the University of Wisconsin – Madison. She now lives in Denver, Colorado. When she’s not speaking and traveling for business, she enjoys hiking in the mountains and being outside. And shopping for high heels. Kelly will be sharing “How to Work With and Lead People Not Like You” and “How to Market, Sell & Serve Customers” as a featured Keynote Speaker at the NARPM® 2019 Broker/Owner Conference & Expo that runs from February 25-27, 2019 at the Mirage Hotel and Casino in Las Vegas.